Small spots 1-3 cm in diameter of yellowed densely tillered plants with shortened roots, that are easily pulled from the turf (Plate 1). Where is Yellow Tuft found? Close mown turf, especially golf greens and bowling greens. In the UK yellow tuft has been observed mostly on Agrostis spp. When is Yellow Tuft likely to attack turf? During cooler, wetter months in spring and autumn. The tufts reduce the wear tolerance of the sward as they can be easily pulled out. Tufts can also affect playability by affecting ball roll and the aethestic appearance of the grass. Soil saturation, flooding, poor drainage. If flooding occurs, pump off water if possible. Promote active but not lush growth. 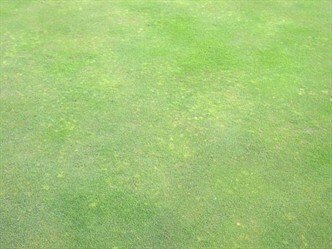 At present there are no fungicides with label recommendation for control of yellow tuft in managed amenity turf.